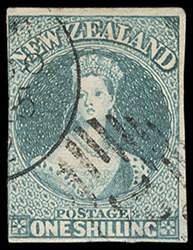 New Zealand, 1857, Queen Victoria "Chalon Head", 1s green on blue paper, Auckland printing, unwatermarked, barred oval cancel, margins ample to mostly in, few small edge thins, about Fine appearance; with 2014 Odenweller certificate. Scott No. 6. Campbell Paterson No. A6b. SG No. 6 £3,750 ($4,930). 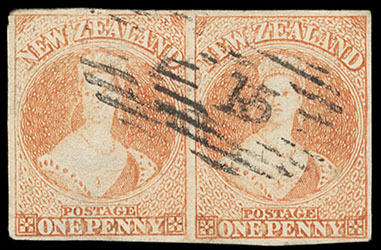 New Zealand, 1858, Queen Victoria "Chalon Head", 1d dull orange, imperf, unwatermarked, horizontal pair, barred oval cancels, clear to ample margins, bright color, couple thins in left stamp and slight oxidation, otherwise Very Fine; with 2015 Odenweller certificate. Scott No. 7. Campbell Paterson No. A1d(1). SG No. 8 £1,500 for singles ($1,970). 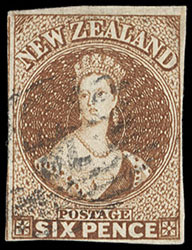 New Zealand, 1857, Queen Victoria "Chalon Head", 6d brown, imperf, unwatermarked, light barred oval cancel, clear to large margins, rich color, Very Fine; with 2014 Odenweller certificate. Scott No. 9. Campbell Paterson No. A5a(10). SG No. 13 £300 ($390). 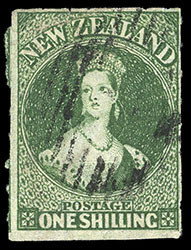 New Zealand, 1857, Queen Victoria "Chalon Head", 1s blue green, imperf, unwatermarked, town and barred oval cancel, margins large to just shaving frameline at left, thin at bottom right, F.-V.F. appearance; with 2013 Odenweller certificate. Scott No. 10. Campbell Paterson No. A6c(2). SG No. 17 £1,800 ($2,360). 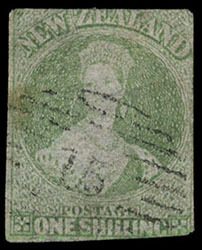 New Zealand, 1862 Queen Victoria "Chalon Head", 1s deep green on pelure paper, rouletted 7, unwatermarked, ample to large margins showing clear roulettes, deep color, postmarked barred oval cancel, barred oval cancel, showing full roulettes at top and sides, margins clear to large, deep color, natural paper wrinkle creasing at upper left, Very Fine, a very rare stamp; with 1987 Odenweller & 2018 B.P.A. certificates. Scott No. 25c. Campbell Paterson No. A6f (1)Z.
SG No. 89 £1,800 ($2,360).